This kitchen roll holders unit stores and dispenses paper roll, aluminium foil, and cling film all from the one organiser. And actually cuts the foil and cling film. Roll out the exact length of kitchen foil or cling film you need and pull across the cutter. There you are, the edge neatly cut, with minimal waste, ready to wrap up your food. As the cutter is on the dispenser, the cling film does not get as much chance to fold over and stick to itself. Similarly, the aluminium foil roll is held and supported as it comes out so it is less likely to rip. Not being foiled again reduces waste. 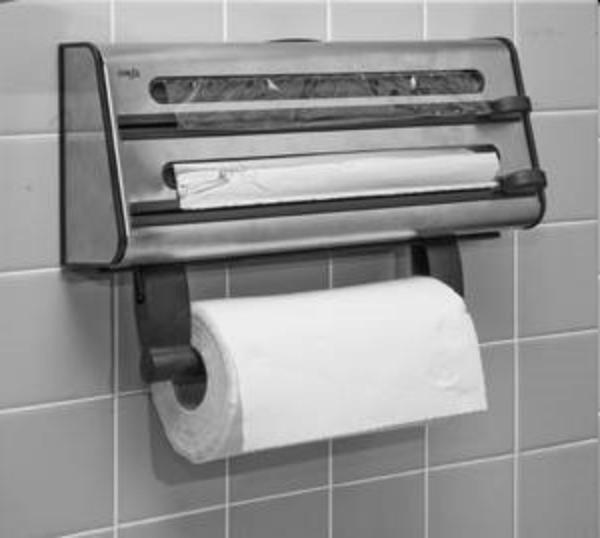 The paper roll holder is cleverly placed way below the foil and cling film dispenser. Reach with wet hands and you are not dripping on materials you will be later wrapping food in. So finally, store cling film, film and paper towels out where you can use them, and cut with handy cutters and enjoy a sleek design. Kitchen Roll Holders text, images and video are copyright.